Is a New Townhome Your Best Option? Whether you’re thinking about your first new home or you’re considering moving for the third or fourth time, you know that you have a lot of options. 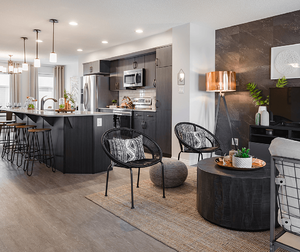 Townhomes sometimes seem like a “lesser” option if you’ve been dreaming about a family home, but there are a surprising number of advantages to this style of home. In fact, the townhome style can perfectly suit people at many different stages of life. Learn more to determine whether a new townhome might be your best option. Any discussion regarding the advantages of townhomes has to start with affordability. With lower monthly payments, you’ll have more money in your budget to spend on things that you love, like vacations or other entertainment costs. You shouldn’t have to pinch your pennies. Townhomes are perfect for those looking for a low maintenance lifestyle. Depending on the neighbourhood you choose, you’ll have things like parks, playgrounds, walking trails, and preserved wetlands just outside your door, but you won’t have to tend to a large property. You'll get all of the enjoyment with less work. Newly built townhomes have all of the design details you’ve been looking for in a home. When you build a new home, you get to choose things like a tile backsplash in the kitchen, quartz or granite countertops, modern or classic cabinetry, and the type of flooring you want. Put together, this creates an upscale, thoroughly modern look. You’ll be proud to invite family and friends over for gatherings. People looking for a great deal know that condos tend to be the least expensive option, but they still have the feel of living in an apartment. Townhomes are more like a traditional house. They have a living area on the main floor with bedrooms upstairs. 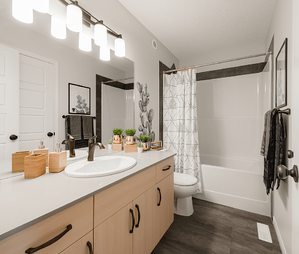 Most townhomes even include the types of features you expect in much larger homes, such as walk-in closets or an ensuite in the master bedroom. There may even be an attached garage depending on the layout. In fact, once you’re inside the home, it will feel so spacious that you hardly realize it’s attached to other homes. Those who are looking for a bit more living space may appreciate the fact that many townhome designs allow for a finished basement. You could have an extra bedroom and bathroom here or just a large rec room for hanging out. This can give your family the space you need without significantly increasing the price. Without the need for a sprawling backyard, builders are often able to create townhome communities in the most convenient locations. New communities also tend to be closer to the types of amenities that people want, such as banks, gas stations, shopping centres, and medical clinics. All around, the townhome option gives you a lot of convenience. Townhomes are a great solution for those looking for a combination of space, convenience, and affordability. With lower starting prices, you’ll be able to include a lot of the upgrades you’ve been dreaming about for your home. If you’re still not sure whether a townhome is right for you, it’s smart to check out our list of active communities and schedule a tour of show homes in this home type. You’ll soon see how great a townhome can be.